Cavalor Vitaflor 365 offers a unique solution for optimising the intestinal flora, thus allowing maximum yield to be obtained from the feed. It prevents acidification of the large intestine, helps put on weight and is ideal for recovery after treatment with antibiotics. 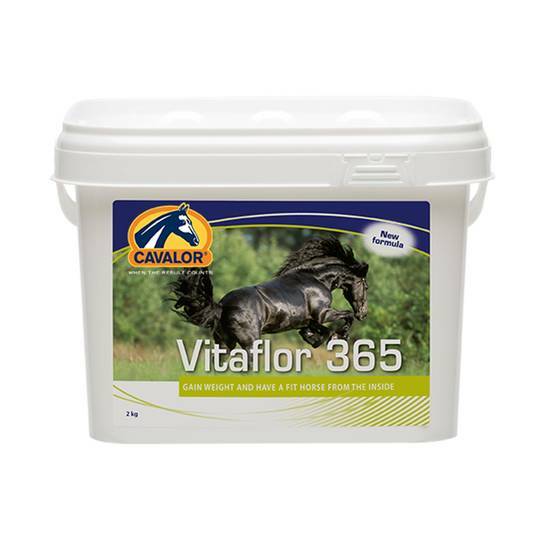 CAVALOR VITAFLOR 365 contains live yeasts and inulin. Live yeast supports bacteria using lactic acid in the colon, preventing acidification (lowering of the pH), ensuring that the micro-organisms present work under optimal conditions. This improves the digestion of crude fiber, the absorption of minerals and the production and absorption of B-vitamins. Thus, a higher yield from the feed is obtained and the incidence of colic decreases. Inulin is a fructooligosaccharide (FOS), which belongs to the family of prebiotic compounds. These are nondigestible feed ingredients that beneficially affect the animal by selectively stimulating the growth and/or activity of one or a number of species already present in the colon. As an indirect result, prebiotic administration inhibits some pathogenic bacteria to develop. Since inulin is not stored in the body, a daily application is necessary to "feed" these microbes to ensure their beneficial effect and protection against pathogens. Mix with the daily feed for a minimum of 4 weeks. Best results are obtained with continued use.